With the LA food truck fad slowly fading into the sunset, it's no surprise that many of have gone brick and mortar. One of LA's original nouveau food trucks, the Buttermilk Truck, however, is steering in a different direction. Next month the popular breakfast truck will celebrate the launch of their Red Velvet Pancake mix and they want you and all your friends and enemies along for the fiesta. Buttermilk will officially debut their mix (which can also be used for "red velvet cookies, brownies and waffles," so they say) at the Autry Farmer's Market at Griffth Park on June 15th from 8 am - 1 pm. Raffles, prizes and food specials are promised. 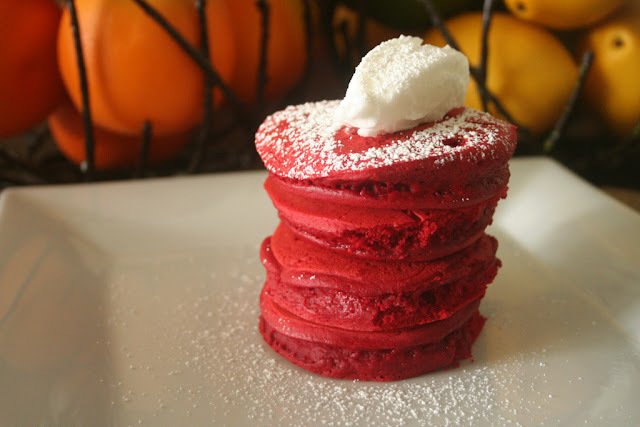 As someone who has had the Buttermilk Red Velvet Pancakes a time or too many, I can say (and you can see yourself in the picture below), they are no joke. Very dense, flavor-packed 'cakes. It will be interesting to see the home mix results.